Gujarat is an un-disputed leader in petro-chemical & plastic industry in India. Mumbai, December 5th, 2012: The Plastindia International University deemed as one of the prestigious universities to be set-up in Vapi Gujarat, saw the presence of delegates and faculty members from University of Massachusetts Lowell (U-MASS), as they visited India to familiarize themselves with the technology practices applied in plastic manufacturing companies in Vapi, Daman and Silvassa, known as a plastic manufacturing hub. 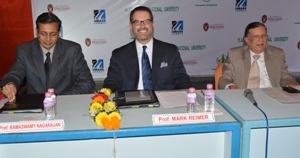 The undergraduate engineering program at The Plastindia International University (PIU) will incorporate all the components of the curriculum that has made U-Mass Lowell Plastics Engineering program an international success. The delegates also interacted with renowned industrialists to understand the educational needs of the Plastic Industry in India and incorporate those elements in the curriculum. The program aims to create a pool of skilled technicians/engineers who can think globally and implement expertise on the work floor that would be beneficial to the industry and economy at large. To address the growing needs of Plastics & Polymer industry and its rapid expansion in Asia Plastindia Foundation conducted a survey with a sampling of 50 key industrialists. The findings highlighted that majority of the employees are non-degree holders with an average work experience of 1-5 years. The industry is in dire need of a knowledge centre and short-term trainings to the technical staff. As majority of the manufacturers are SMEs, it becomes difficult for them to obtain the industrial higher skill courses needed for the technical knowledge required for product innovation. Moreover, it is expensive and are un-available locally. Long-term training is not feasible to the manufacturers as they operate on lean workforce. Polymer Technology from Concept to Commercialization. The focus is on providing a knowledge based institution rather than a resource based one. This survey data will be used to design and focus the educational curriculum needed to built skilled professionals in the plastic industry, staying within the set guidelines of the accreditation authority. Plastindia Foundation is the apex body of major Associations, Organisations, and Institutions connected with plastics including Government and Semi-Government Organisations. The main objective of the Foundation is to promote the development of Indian plastics industry and to assist the growth of plastics and related materials and their products. It is dedicated to the national progress through plastics and is striving hard to make India a preferred sourcing base for plastics products for the world. Working as a catalyst, the Foundation works to build awareness of the significant contribution made by plastics to society and the environment. It also creates a positive policy framework with all statutory entities and increases per capita consumption of plastics, encourage exports thereby significantly contributing to national growth. In order to enhance the image and the growth of Indian Plastics Industry, the Foundation holds world-class exhibitions in India at regular intervals, where it provides opportunities to demonstrate the industry’s capabilities.